High Quality Content by WIKIPEDIA articles! Munsee (also known as Munsee Delaware, Delaware, Ontario Delaware) is an endangered language of the Eastern Algonquian subgroup of the Algonquian language family, itself a branch of the Algic language family. 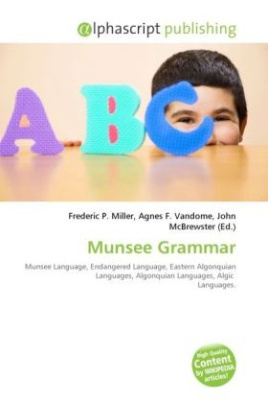 The grammar of Munsee is characterized by complex inflectional and derivational morphology. Inflection in Munsee is realized through the use of prefixes and suffixes added to word stems to indicate grammatical information, including number (singular or plural), gender, person, possession, negation, obviation, and others.